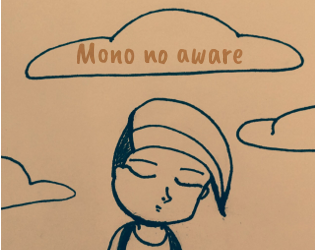 Mono no aware is a tiny flatgame about melancholy. According to Wikipedia Mono no aware (物の哀れ) means, literally "the pathos of things", and also translated as "an empathy toward things", or "a sensitivity to ephemera", is a Japanese term for the awareness of impermanence (無常 mujō), or transience of things, and both a transient gentle sadness (or wistfulness) at their passing as well as a longer, deeper gentle sadness about this state being the reality of life. It was made in Flatpack using some of my drawings from Inktober 2016. The song is Kawarayu by Yubatake. Mi inglés es muy malo, perdón, muy interesante el concepto de "Mono no aware", me recuerda (en ciertos términos) al spleen de Baudelaire, pero más complejo y más "meditativo" (no tan sólo melancólico). Sí, pasa que lo armé justo en un momento que tiraba más hacia la melancolía, pero la mayoría de los flat games sirven bastante para meditar y tener una mejor percepción de las cosas.